(MENAFN Editorial) Electronic tongues, ethical meats, digital agriculture, seawater farming, and other gastronomic curiosities will disrupt the way our food is produced and consumed. How close are we to the food of the future? And will your fork make sure you chew more slowly? Dubai, UAE, February 14, 2018:A single pellet dense with nutrients as well as taste may constitute your entire meal as the 21st century progresses. Taken with water, it will also make you feel full. But that’s only an entre in the future of food (or possibly the entire meal, if you’re an astronaut). Plants that grow in vertical farms using 95 per cent less water, meats that are grown in the laboratory, 3D printed pizza, how food influences our genes and vice versa in nutrigenomics, tomatoes that tell the farmer when they will ripen via digital agriculture methods… These developments are all changing what we eat and how nutrients find their way into our bodies. An important factor in food is its relation with emotion and wellbeing so much so that what astronauts eat on space missions is carefully personalized not just to provide essential nutrients but to cater to their unique preferences in a zero-gravity environment where smell and taste are diminished. NASA’s preparations for a potential space mission to Mars by the 2030s include taking into account the fact that gravity will enable astronauts to keep a vegetable garden and boil water in a pressure cooker. At the World Government Summit (WGS) 2018 in Dubai from February 11-13, 2018, the future of food came up in many ways including the implications of genome editing on food, emerging technologies and their relationship with ending hunger, and the relationship of your gut to overall health. Anshu Vats, Public Sector Practice Head of management consultancy Oliver Wyman, which released a paper titled Agriculture 4.0: The Future of Farming Technology, says, ‘We believe that the Fourth Industrial Revolution has reached agriculture. In the Netherlands, for example, 35 per cent of produce is coming from one per cent of land. Saudi Arabia has now started to work on saline tolerance and microbes. The Commonwealth Scientific and Industrial Research Organization (CSIRO) in Australia is running a program that uses technologies such as the Internet of Things (IoT) and blockchain to produce higher yields. Worldwide there is much interest in food production and technology. Global venture capital investment in agtech reached USD 3 billion in 2015. In November 2017, Swedish furniture giant IKEA, along with Dubai-based holding company Meraas and restaurateur David Chang, were among those who invested a total of USD 40 million in Aerofarms, based on a vertical farming system that uses 95 per cent less water than traditional farming methods. The system doesn’t rely on sunlight or temperature, grows produce in half the time, and doesn’t deplete the planet’s soil. In 2014, private equity firm KKR & Co invested USD 100 million in UK-based agribusiness Sundrop Farms Holding, which uses solar panels and seawater to grow vegetables in a greenhouse in Australia. Microsoft co-founder and philanthropist Bill Gates and the founder of the Virgin Group, Richard Branson, are among those who have invested in a start-up that grows meat from cells in a lab. The food of the future came into sharper focus with NASA’s space exploration programs. Some of the foods astronauts eat are dehydrated, to save on space and weight. These foods typically come in snippable packages, so water generated by shuttle fuel cells can be added. Other foods, like fruits, fish and meat, are thermostabilized or irradiated to kill micro-organisms and enzymes. And still other foods, like nuts and baked goods, are fine just as they are. But with missions now lasting years instead of months, NASA is working on training astronauts to build ‘hydroponic growth labs’, where they will grow vegetables, potatoes, soybeans, wheat, rice, and beans, much like another emerging trend: urban farming. 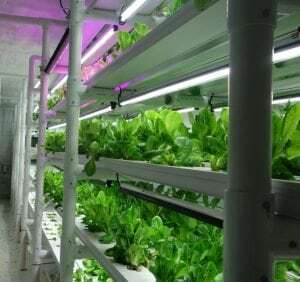 As technology allows for more compact agricultural infrastructure, future food scenarios include automated vertical farming, which has proven to be 100 per cent more productive per acre than traditional farming. Fresh fruits and vegetables are grown right where they are consumed, resulting in fewer carbon dioxide emissions from transportation and the availability of fresh fruit and vegetables all year. The controlled environment reduces the risk of disease and drought. An integration of fish farming, or aquaculture, and soil-free agriculture, or hydroponics, is a relatively new technique called aquaponics. Fish convert their food into nutrients that plants can absorb while plants clean the water for the fish. The investment is being seen across the food value chain. Consider food scanners. Imagine holding a device over your scrambled eggs and watching its journey from farm to table. Food scanners can tell you exactly which ingredients make up your meal, the amount of calories, sugar, allergens, and toxins. Canada-based TellSpec crowd-funded its plan to create a hand-held food scanner that can inform users about specific ingredients and macronutrients. Already, it says, its technology can be used to test the quality, ripeness, and flavor of fresh fruit in less than 15 seconds, including telling you how sweet or sour it is. Devices can now scan and inform you about the amount of pesticides or antibiotics in a particular food. Also, electronic tongues are being used to sense and detect organic and inorganic compounds in foods. The field of nutrigenomics is a combination of genetics and nutrition science that can help you adapt your food intake to what is best suited to you. Smart, healthy food is consumed using smart utensils cutlery can come with stabilizing handles for the elderly or those with shaky hands. As humans, we are aware that we don’t always do what’s good for us we can’t help but reach for the bar of chocolate even when we’re full, we eat more sugar than needed when we’re stressed, we wolf down large helpings of fried stuff. Already, a fork that polices your food intake is in the market. HAPIfork buzzes when you eat too fast rather than taking in a mouthful every 10 seconds. The technology combines the desire for mindful living with the discipline of a watchful parent. Drones are already being used in agriculture, while sensors in soil can record information on factors such as salinity, moisture, and plant health to build more efficiency into the process. The future farmer will be able to predict down to the hour when his tomatoes are expected to ripen. The food industry is also leveraging 3D printing technology, which, in the future, could enable us to produce our own foods. As proof of concept, in 2013, NASA’s food printer printed a thin pizza that baked in 70 seconds after printing. In its commercial avatar, it uses edible ingredients squeezed out of stainless steel capsules to make brownies or quiche. The Netherlands Organization for Applied Scientific Research has developed a printing method for microalgae, which is a natural source of nutrients including protein, carbohydrates, pigments, and anti-oxidants. The next step would be to turn these into foods that we recognize putting together, among other things, carrots, or shortbread cookies. Bioplastics are changing food packaging. Other types of utensils are made of edible materials such as Loliware’s cups, and now straws of the future are edible and biodegradable, made from seaweed and organic sweeteners, with flavors and colors derived from fruits and vegetables. Sustainable foods form another direction for the industry. Using advanced machine learning to understand the chemistry of animal products like milk and eggs, start-up companies are developing plant-based products that look, feel, and taste the same as the originals. Artificial mayonnaise, yogurt, cheese, and milk are already being developed in such ‘factories’. Grown in genomic labs, meat is being cultured from animal cells, meaning that the burger on your plate didn’t actually come from an animal. Dutch company Mosa Meat launched the world’s first ‘clean meat burger in 2013. In January 2018, San Francisco-based just debuted its new plant-derived scrambled ‘eggs for the Asian markets in Hong Kong. Back to those capsules, but not quite yet. Food companies targeting those who want a meal on the go but not necessarily a burger are creating meal replacements that you glug and go. Soylent, a meal replacement powder mixed with water, contains all the nutrition necessary for an average adult. The product takes its name from the novel ‘Make Room! Make Room! by Harry Harrison, which explores the impact of overpopulation in a world with dwindling resources, sparking the creation of a new food called Soylent, made of soy and lentils. Today’s Soylent products don’t actually contain the whole soybean, but rather use the protein isolate and lecithin that is derived from soy.